Home > Draper Natural History Museum > The Draper Museum Raptor Experience > Turkey Vultures or Black Vultures? What kind of a vulture is that? If you are in the Cody area, you know it’s a Turkey Vulture. 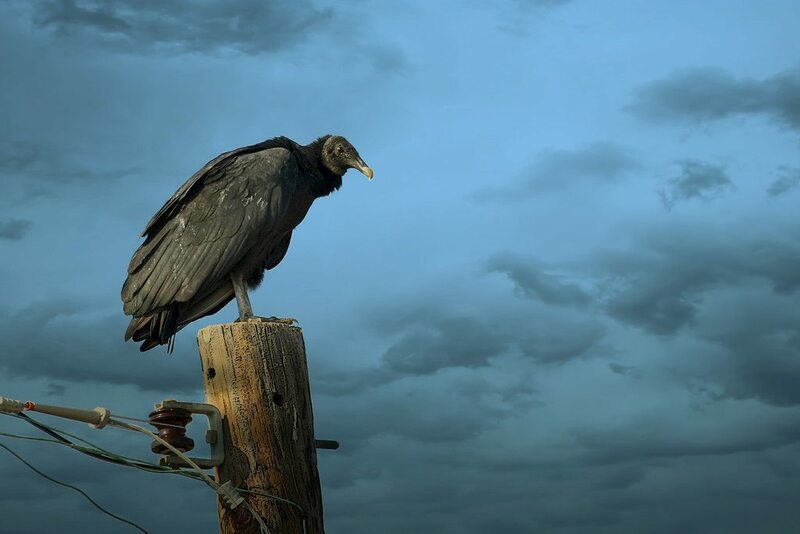 Turkey vultures are the only vulture that migrates to Wyoming for the warmer months, where they help keep our environment clean and disease free by dining on dead animals. In the southern parts of our country, and more recently New England, there are both Turkey Vultures and Black Vultures. Turkey Vultures have an excellent sense of smell, and may be able to smell the gasses rising off of a carcass from 5-miles away. Black Vultures lack this ability, though they have learned to take advantage of the Turkey Vulture’s sense of smell. To locate food Black Vultures may soar high, looking for food with its excellent vision, as well as keeping an eye on Turkey Vultures. If a soaring Turkey Vulture smells a delicious meal, the Black Vultures will simply follow the Turkey Vulture as it descends down to the carcass. 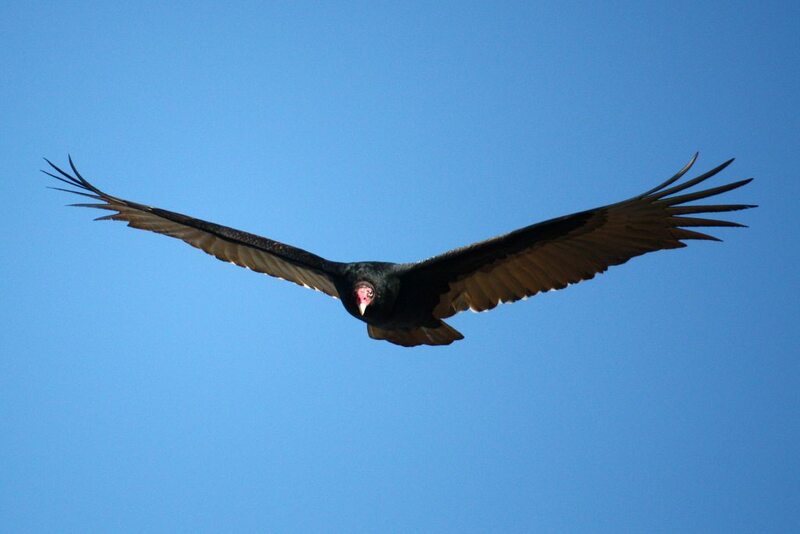 Turkey Vultures are more solitary when hunting than Black Vultures and often hunt alone or in small groups. Black Vultures, however, will often hunt in larger groups. Being more aggressive birds, a large group of Black Vultures can easily take over a carcass from a solitary, or a small group of Turkey Vultures. 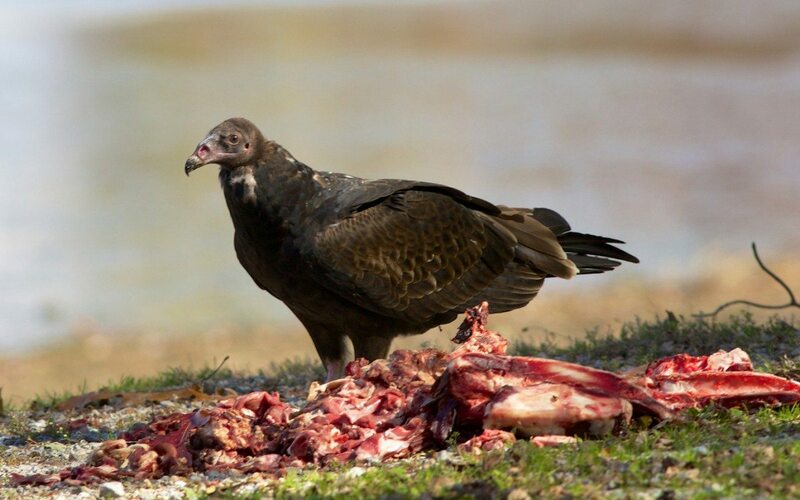 If, however, there is one of each type of vulture on the carcass, the Black Vulture will usually lose out to the slightly larger Turkey Vulture. If you live or visit an area where both types of vultures reside, identifying them may be confusing. If you are looking at a perched adult, it is easy. 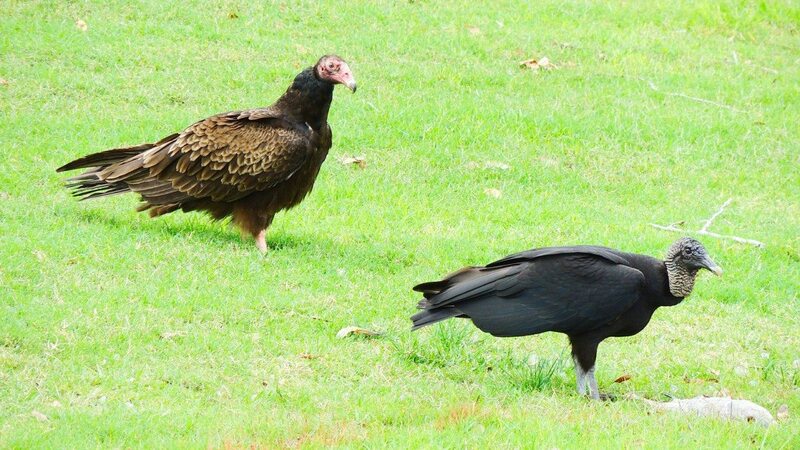 The Turkey Vulture has a red head, while the Black Vulture has a black or dark gray head. 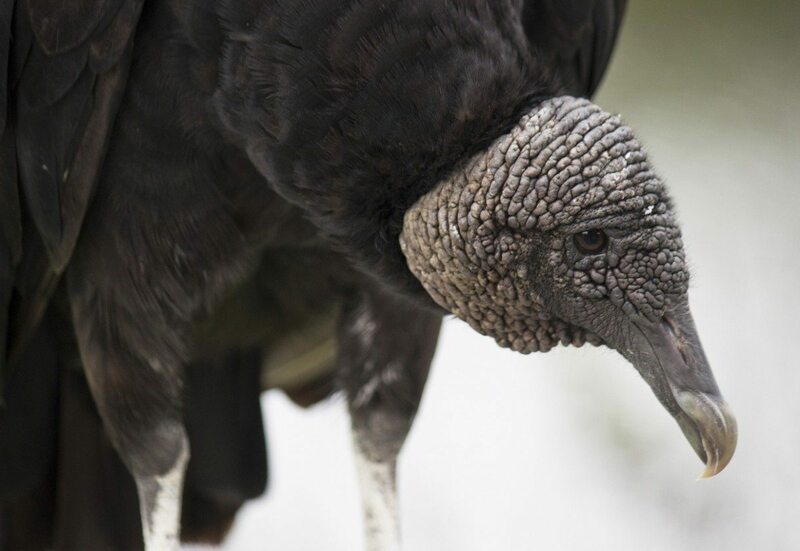 Black Vultures have black or gray heads. The bill of an adult Turkey Vulture will be white, while the Black Vulture has a dark bill with bone colored tips. When seen up close, the feathers of Black Vultures are a sooty black, while a Turkey Vulture’s dark feathers also include dark brown. This plumage difference will be very helpful if the bird you are observing is immature. Turkey Vultures less than a year old have dark gray heads and dark bills, similar to a Black Vulture. 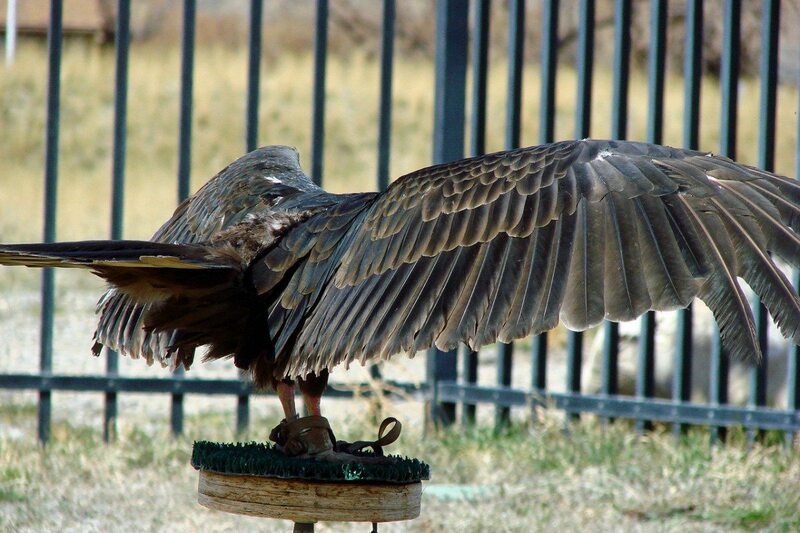 Notice the brown color on Suli, our Turkey Vulture’s wings. You would not see this on a Black Vulture. In flight, if seen as a silhouette, there are a few characteristics that may help you. Black Vultures have shorter tails, with their tails ending near the tips of their toes. They also tend to soar with their wings held almost flat. 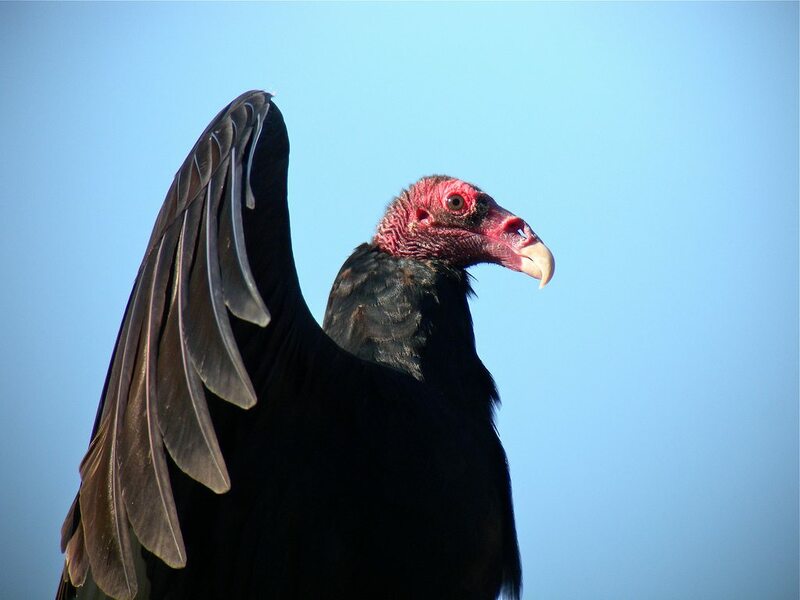 A Turkey Vulture, on the other hand, generally holds its wings in a dihedral position (shallow “V” shape). Turkey vultures also teeter back and forth as they soar. The flight pattern also varies among the two species. 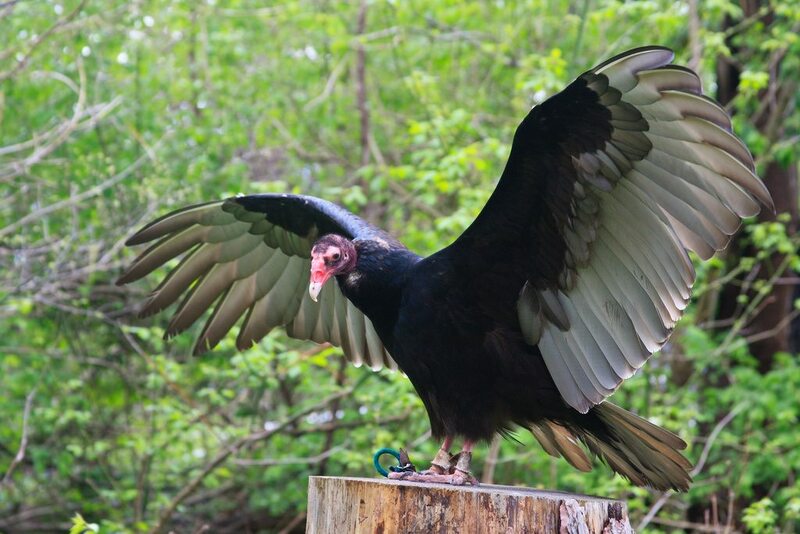 A Turkey Vulture will soar for long periods of time – possibly up to 6 hours – without flapping its wings. When they do flap, the wing beats are slow, perhaps only 1 flap per second. Black Vultures flap more frequently and quickly. 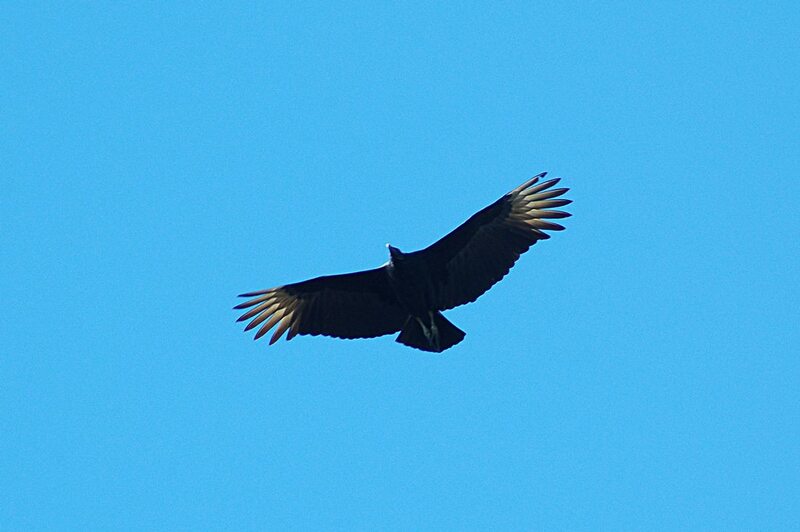 When soaring, the Black Vultures do not teeter back and forth as the Turkey Vulture does. From a distance, the body feathers of both birds look black. However, if observed in good light conditions, looking at the underside of the open wings will give you an easy, sure way to identify these birds. The silvery or whitish gray wingtips (fingers) and flight feathers give the Turkey Vulture a two-toned appearance. Although less noticeable, the tail also sports this silvery gray on its underside. 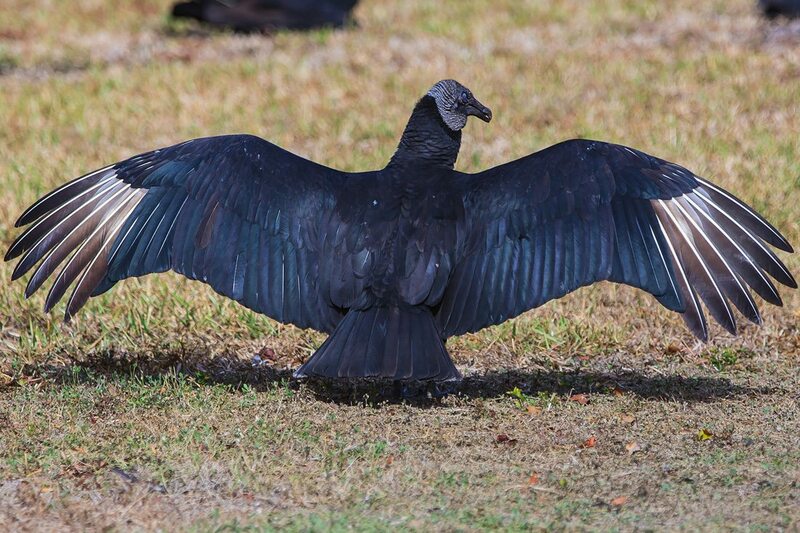 The Black Vultures are mostly dark in color except for white patches on the wingtips, sometimes called “stars.” Think of the Black Vulture as dressed in black evening wear with white gloves on its hands. The silvery color on the underside of a Turkey Vulture’s wings creates a broad, trailing light colored edge to the wings. Black Vulture’s have black wings with white or light gray wing “fingers,” that can be seen from the front or back of the vulture’s open wings. If you have vultures in your area, look to the skies and enjoy the beauty of these birds as they move about. And remember, without the vultures, reeking carcasses would linger longer, insect populations such as flies would increase, and diseases would spread.